For some people, picking a backpack isn’t too hard. They head over to their local REI and pick the latest North Face or Osprey pack that they find. They’re functional, they hold your laptop and they come with 2 dozen pockets for 24 different pens. The problem is, they also make you look like you’re ready to hit the trail or are training for Everest basecamp. At best, you end up looking like a backpacking tourist with a rucksack and a million straps. Minus the zip-off pants, I hope. If you’re searching for the best everyday carry (EDC) backpack or the best backpack for work, sometimes, less is more. You don’t want big bulky hip belts or large branding. 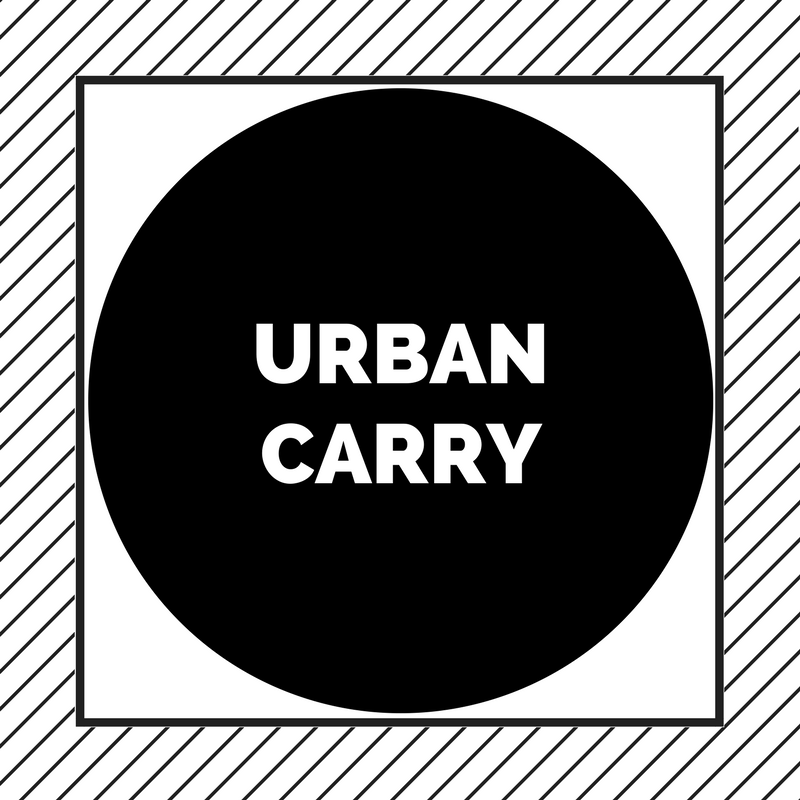 You want something that can handle the urban environment with ease. A pack that will effortlessly take on a subway commute, a trip to the local coffee shop, yet still blend in at work. On this list we focus on backpacks with minimal or no branding, clean lines and simple silhouette’s, with no tactical molle or rows of loops to hang eight different carabiners. Best of all, all six backpacks featured here are available in all-black. A classic and streamlined design. When you think “backpack”, this is probably the design that first comes to mind. With faux-leather reinforcing the bottom, the Heritage pack also has one lash tab on the front face of the bag (the diamond shaped thingie) which is great for attaching a carabiner or a bike light. There is an internal laptop sleeve that can fit up to a 15″ Macbook, but only the side closest to your back is padded. 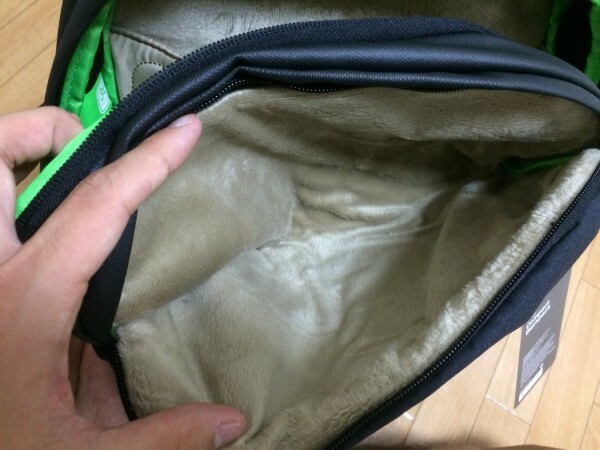 There is another small pouch in the main compartment, designed to carry a phone or music player, with a little port to thread your headphones through. Not sure how many people would find that useful? But it’s there if you need it. The inner lining is in Herschel’s signature striped red lining. 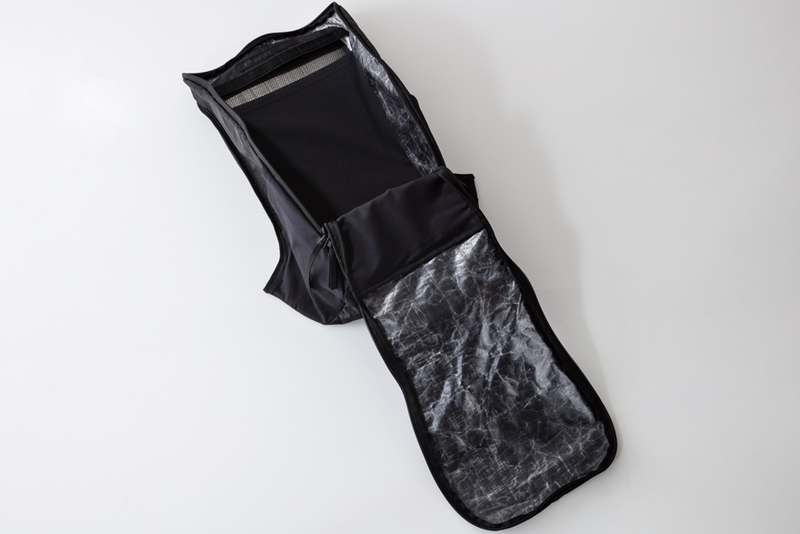 This bright inner lining might not be to everyone’s taste, but it is actually very functional since it helps you easily see the contents of your bag. The straps are well padded, which are a huge plus if you load this up with textbooks or groceries. One big downside is that there are no side pockets for a water bottle. There is one external pocket on the front, measuring 9″ x 6.5″ – that’s a really good size. This pocket is big enough to fit an iPad Mini. There is also a key loop inside this pocket. If you want something minimal, clean and functional, without making you look like you want to go conquer a mountain, this is pretty hard to beat, especially considering the price tag. If you don’t quite dig the all-black look, it’s available in a lot of different color combinations. 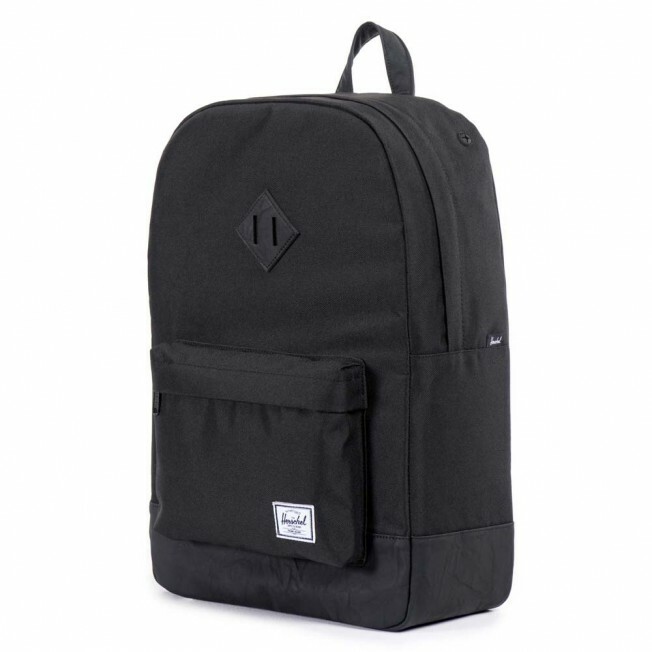 It’s also available in various sizes: The Herschel Heritage Mid-Volume is suitable for shorter and more petite people, it’s a smaller 14 liter pack coming in at 16.25″ x 10.5″ x 4.5″ (fits up to a 13″ laptop). The Herschel Heritage Kids is a 9 liter pack measuring 13.12″ x 9.5″ x 3.75″. It’s not just for kids though, if you are a fairly short adult, with a very petite frame, the kids version would be perfect. 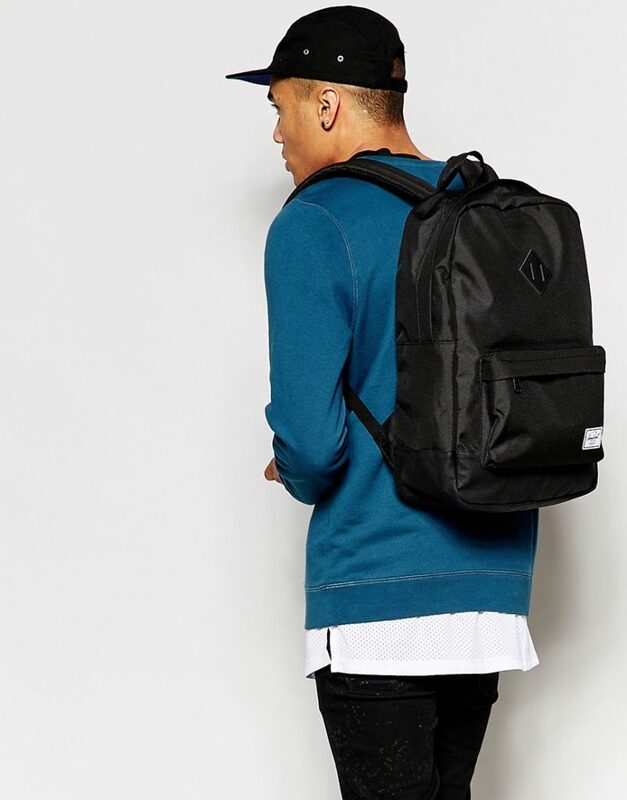 Buy the Herschel Heritage Supply Backpack on Amazon. The first thing you notice about the Nano is the weight – or lack thereof. This is one ultra-light backpack. With an 18 Liter capacity, the Nano is perfectly sized for a daypack or office backpack. It is made of water-resistant ripstop, with waterproof zippers with silicone coated zipper pulls. The straps are well padded, and include an adjustable sternum strap (slides up and down) which works well in transferring some of the load to the chest. There is a small top handle that is unpadded. It’s probably best used for hanging the bag only, and not as a grab handle, since it’s really not that large. There are three external pockets – one on each side and a large ‘floating’ pocket on the front of the bag. One great thing here is that all these external pockets have zippers. This makes them perfect for valuables that you want quick access to – metrocard, earbuds, cash etc.. but sadly, you won’t be able to stick a water bottle in the side pockets or even a large smartphone (your phone will have to go in the large floating pocket). 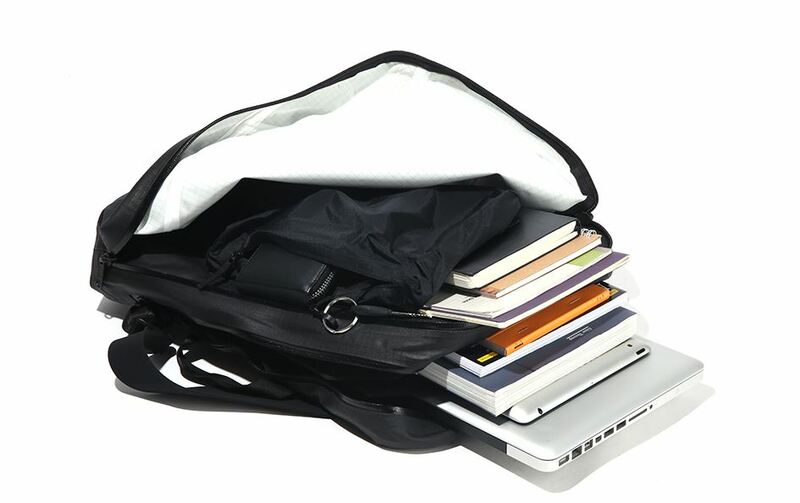 The inside does not skimp on organization either – there is a padded laptop sleeve, as well as smaller mesh organizer pockets. Having this level of organization is rare in lightweight and unstructured packs. The fabric is very cool, but even without the self-healing magic, the NCT Nano backpack is a fantastic lightweight backpack, with a unique fabric and a serious under-stated look that’s typically reserved for more expensive packs. Buy the In Motion NCT Nano Backpack on Amazon. This is for those who want to carry a bit more. 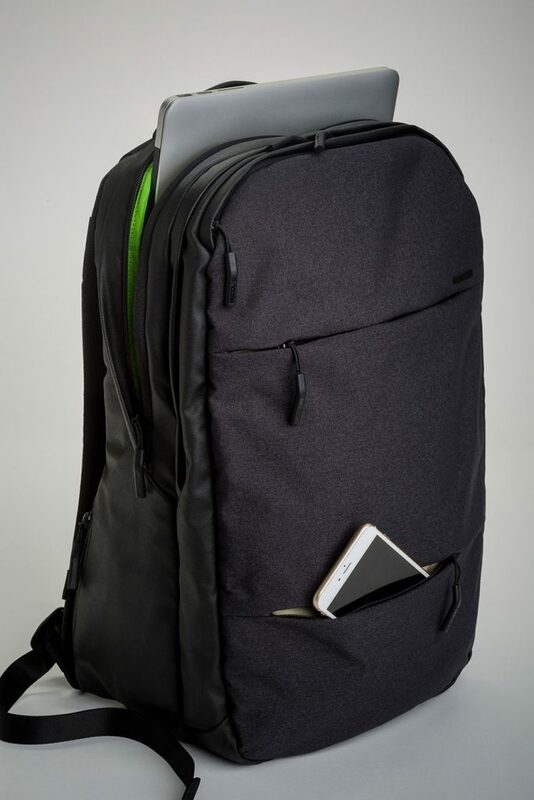 This is a fairly tall backpack that can fit up to some 17″ laptops (it’s a tight fit). It can swallow 15″ laptops easily. 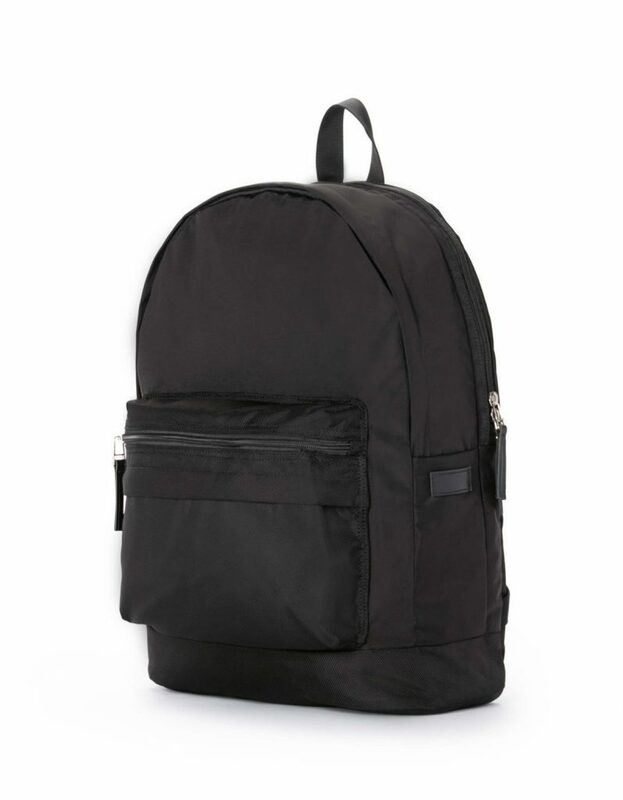 At 20″ tall, it’s slightly taller than most backpacks which means it may not be great for short people. The good thing is that it’s very slim (in terms of depth) so it won’t bulge out too much from your back. Even fully loaded, this won’t look like a ninja turtle pack. Even though it’s a tall bag, the slim depth really helps in keeping the bulk down. 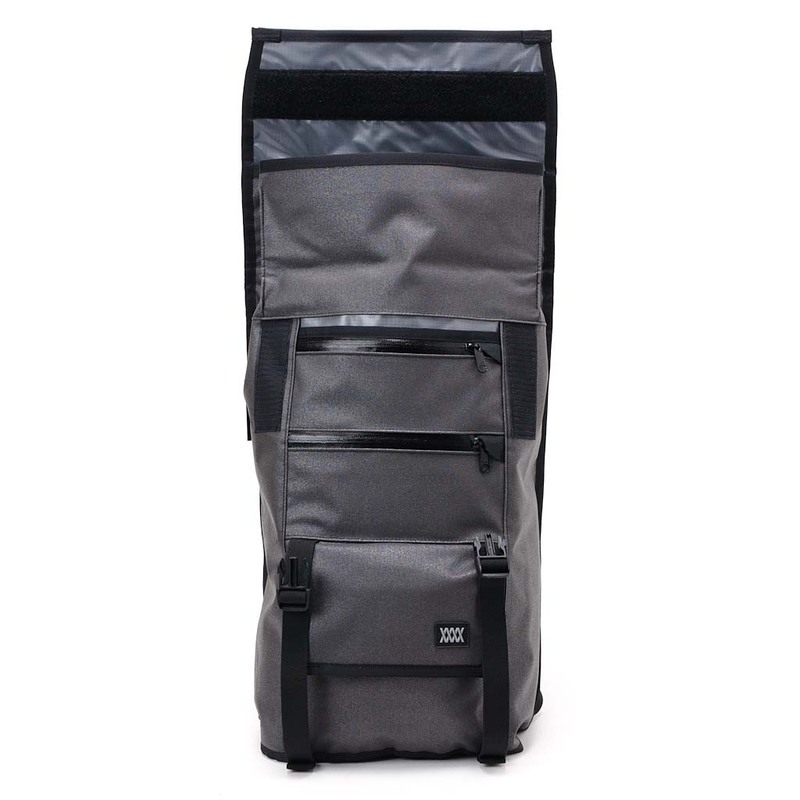 Combined with the very nicely designed top handle this is a pack that is easy to maneuver in tight spaces like a crowded train or the streets of NYC, despite the height. 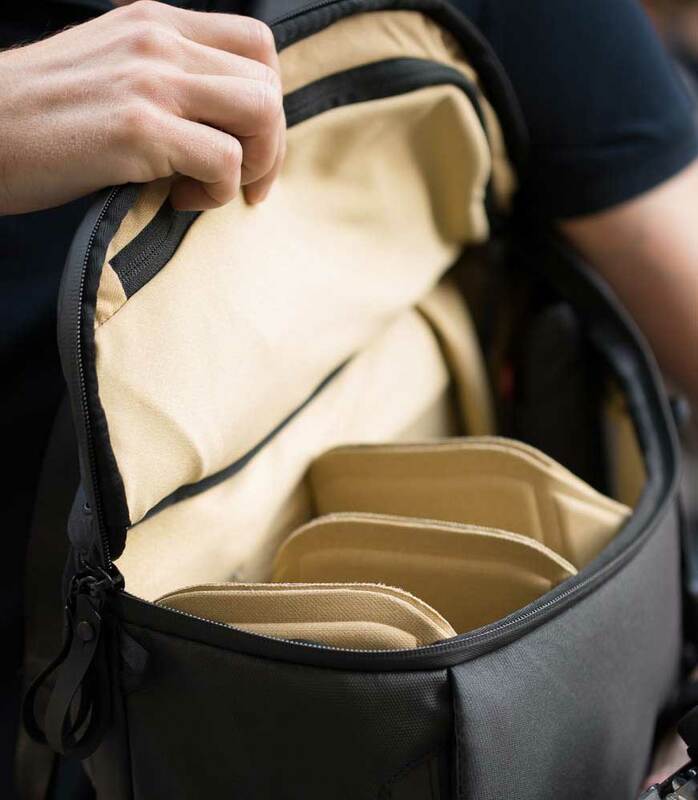 But, if you still want a shorter version of this pack, check out the InCase City Compact which shaves off about 2″ from the height of the bag but can still carry a 15″ Macbook. 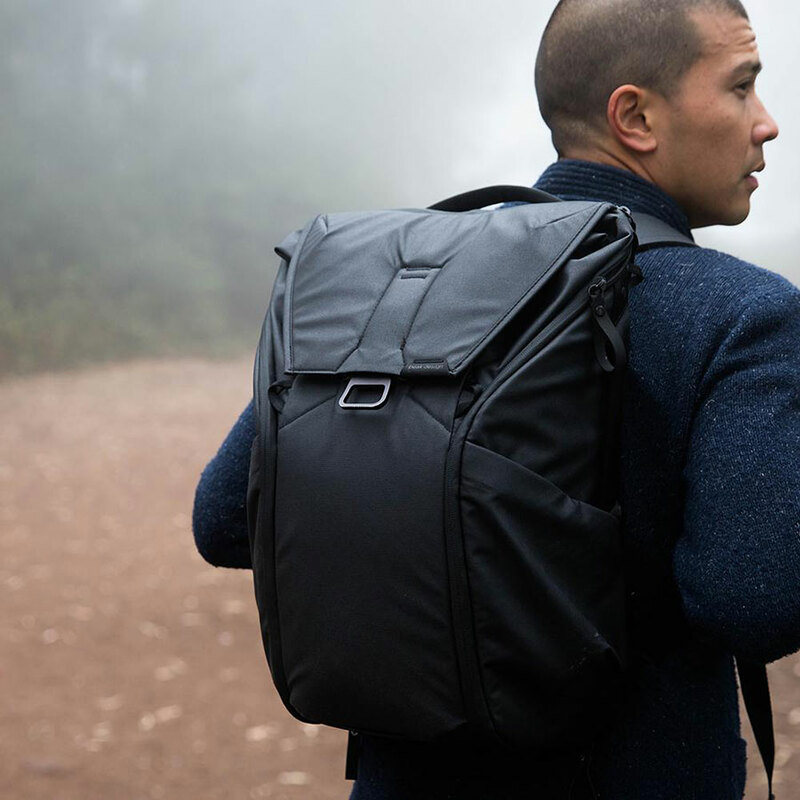 This is one of the best tech-centric minimalist backpacks in this price range. The laptop compartment is well padded from all sides, with one side lined with a fleece-like material (it’s not really fleece, we don’t know what it is, but it’s very niiiiice). You definitely won’t need a laptop sleeve for this bag. It does not have an external water bottle pocket, but it comes with a lot of internal organization – there are tons of open-top pockets and mesh pockets for all your tech stuff – chargers, power cables, external hard drives, external battery packs etc.. There is a separate top pocket that is lined with the same soft fleece-like material, suitable for sunglasses, a large phone or even a full sized headphone. There are two small “hidden” pockets on the back, on each side near the bottom of the shoulder straps, perfect for quick access to earbuds, your wallet, or a small phone. Made of water resistant material with unobtrusive branding, the Incase City backpack will have no problems blending-in in a professional environment. 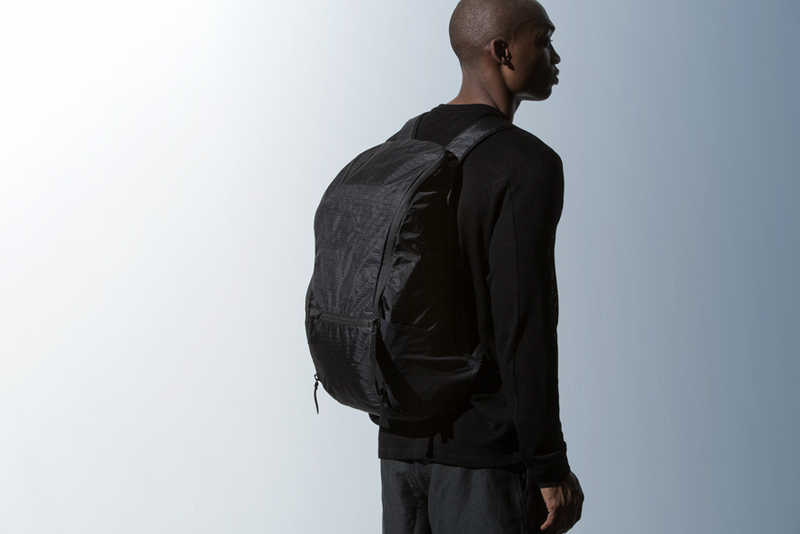 This might just be one of the best minimalist work backpacks out right now. You can shop the Incase City Backpack on Amazon. Taikan Everything is a new carry brand out of Vancouver, BC, Canada and this is a fantastic take on a classic design. 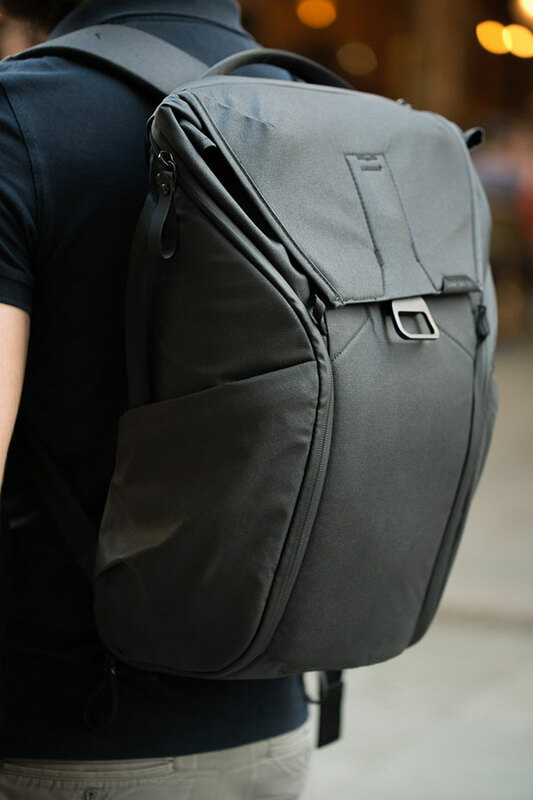 This backpack’s silhouette is a classic through and through, but the details and color decisions end up resulting in a great looking modern and urban-friendly carry piece. The Lancer is made of ballistic nylon, with a dedicated laptop compartment and a main compartment with internal organization pockets. On the exterior are two zipped pockets. This is really a well thought out minimalist pack, with lots of great details – you’ve got leather pull tabs on the zippers and nickel finished YKK zippers. We’ve also been impressed with their color choices so far. It’s an impressive debut from a new brand, and we can’t wait to see what else Taikan has in store for the future. You can shop the Taikan Everything Lancer here. You’ve probably heard of this pack already. If not, you’ve most likely seen one. It’s one of the hottest packs out right now, and it’s hard to walk around in a major city like NYC or Hong Kong and not see at least one of these. Or at least, one of the other colors of this pack. Because this murdered out all-black version is relatively new. And man, is it a beauty! I’ve been waiting for Peak Design to release their bags in all-black fabric, and they’ve finally delivered. We waited a long time for a murdered out black version. They really did this one right. Even the logo and the hardware are black. I’ve never been a fan of the old charcoal color with its red accents. I know lots of people like them, but they just looked too distinctive to me. Coupled with the unusual shape and design of the maglatch closure system, the accent colors were just a tad too eye-catching for my taste. I prefer my bags to fly under the radar just a bit. The 20 Liter Everyday Backpack does just that. But it still does it in style. If you’ve never heard of Peak Design, they’re a photography accessory company based out in San Francisco. They make some excellent camera straps, and as you can see, they also make some interesting carry gear. They started off with an Everyday Messenger Bag, which was the most funded bag in Kickstarter history, in 2015. They’ve since followed it up with the Everyday Backpack – available in 2 sizes (20 Liter and 30 Liter) and a couple of sling bags, even a tote bag. Don’t be put off by the camera bag accessory maker label though. There’s a reason why Peak Design calls their bags ‘Everyday bags’ – because they’re not just for photography gear. You can pull out all the dividers and use it like a regular pack, or you can keep them in their and just use them to organize your stuff. The 20 Liter Everyday Backpack is the smaller of their 2 backpacks (the other being the 30 Liter), and for most people, it’s the best size for everyday carry. Clean lines. Here’s a closer look at the adjustable magnetic maglatch flap, and the 2-zipper configuration on one side. (The bottom zipper is kind of hard to see) But you’re able to swing the pack to one shoulder, and get into the bag using either the top zipper or the bottom zipper, depending on what part of the bag you want to access. Since it’s still a photo-centric, it comes with a lot of features that end up being useful even if you are not a photographer. The ability to quickly throw it off one shoulder and open the bag via the quick access side zippers for example is well implemented. 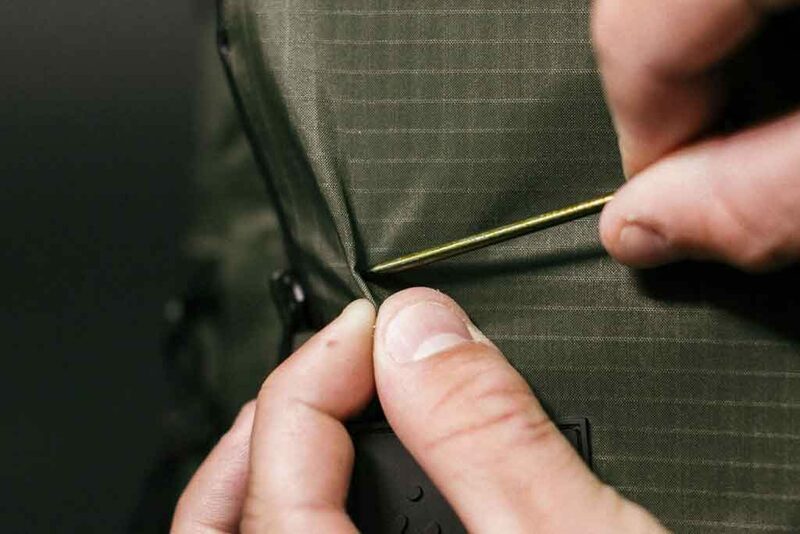 All Everyday packs have a quad-zip design – that is, there are 2 main zippers on each side. This allows you to open and close the pack from the top, or from the bottom. That’s four zipper pulls, in four different directions. It’s a really clever solution that isn’t found on many backpacks. (The Outlier Quadzip, below, features a similar zipper set-up). The tan interior also helps a lot with visibility. Some people won’t like the decision to not use black for the interiors, but we’re not complaining. That few precious seconds you are able to save when peering through this bag vs the typical black hole of a dark backpack will make you appreciate the bright interiors. Here you can see the bag opened for quick access, while swung off one shoulder. The bright interiors will keep small items from disappearing in the corners of your pack. The flex fold dividers are removal, but are useful if you want some internal organization. The flex-fold dividers are also extremely useful. While they were designed to hold lenses, camera bodies, and other photo gear, there’s not reason why you can’t use them to organize your stuff as well. It helps me keep my headphones away from my lunch, and it helps keep my ridiculously overkill Anker battery pack from bouncing around too much. All in all, this pack is really worth the hype. The only reason we hadn’t jumped on it sooner was the limited color choice. But now that it’s available in all-black, we’ve run out of excuses. Just get one already. Mission Workshop is one of our favorite carry brands, and they never fail to impress. 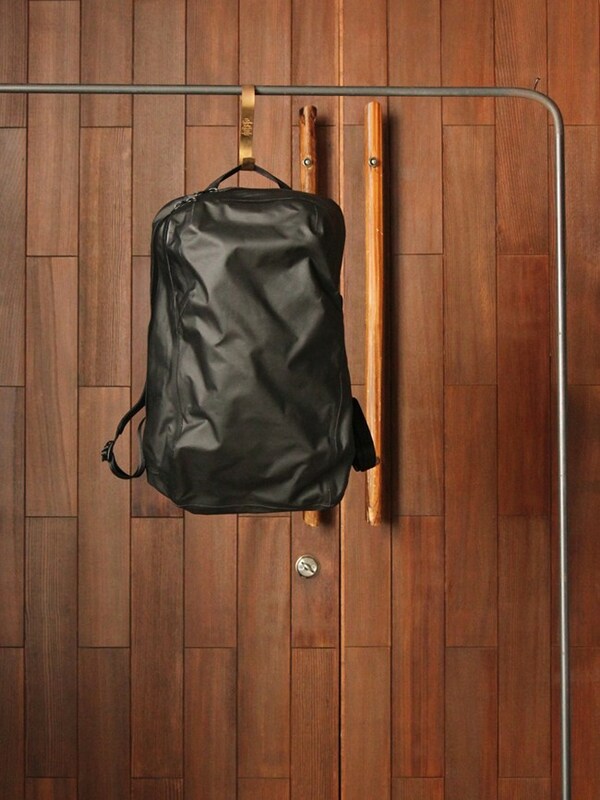 Made in the USA, the Sanction is a slim rucksack, made with extremely weatherproof materials. Although it’s a very clean design with minimal branding and no unnecessary flourishes, it’s very distinctive. This isn’t a pack that’s trying to blend in. 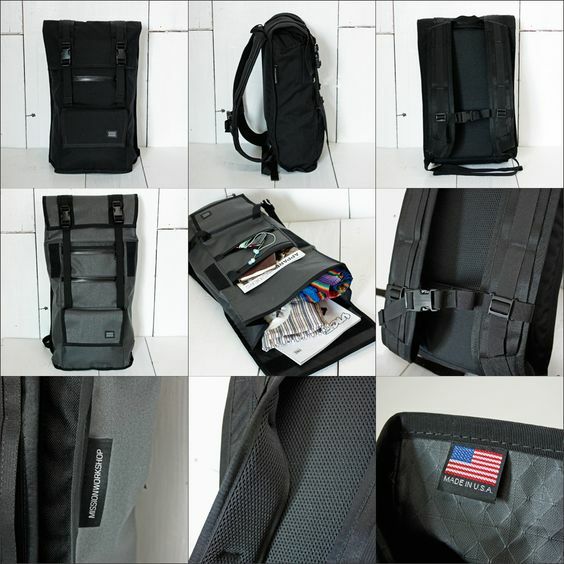 The big story here, as with all Mission Workshop bags, is the bomb-proof build quality and weather resistance. This is a bag that will take a beating, and then some. Even people who know nothing about bags, once they see this pack, they somehow know that it’s a tough, durable bag that won’t be afraid of a rain storm. 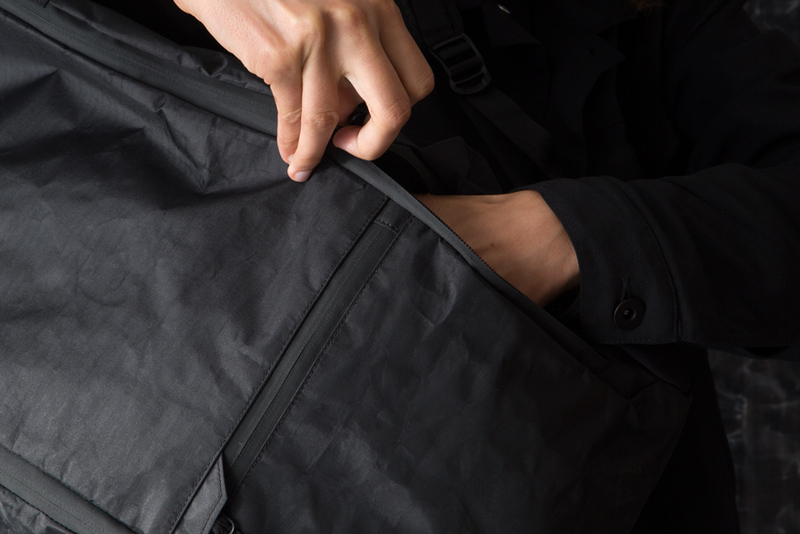 There is a reason Mission Workshop offers a lifetime warranty – they know their bags are built to last. The biggest downside to this bag is that it doesn’t have any padding in any compartment. So if you plan on carrying around your laptop, you will need to put it in a padded sleeve. From the top, the bag has two compartments that cover the length of the bag. The main compartment, closest to the back, has a zippered divider. There are three other smaller compartments under the flap – two of them are small pockets with zips. Below these is another exterior pocket secured by a velcro flap – this is the only pocket accessible without opening the main flap. Overall, this wasn’t designed to be a tech backpack. But I personally don’t see this as an issue. With a little clever use of organizing pouches and tech organizers, this can easily transform into a perfect weatherproof pack. It’s a pricey bag, but the build quality is in line with the pricing, and it comes with useful extras such as a built-in sternum strap and an internal ulra-light frame sheet that helps with balance and heavy loads. 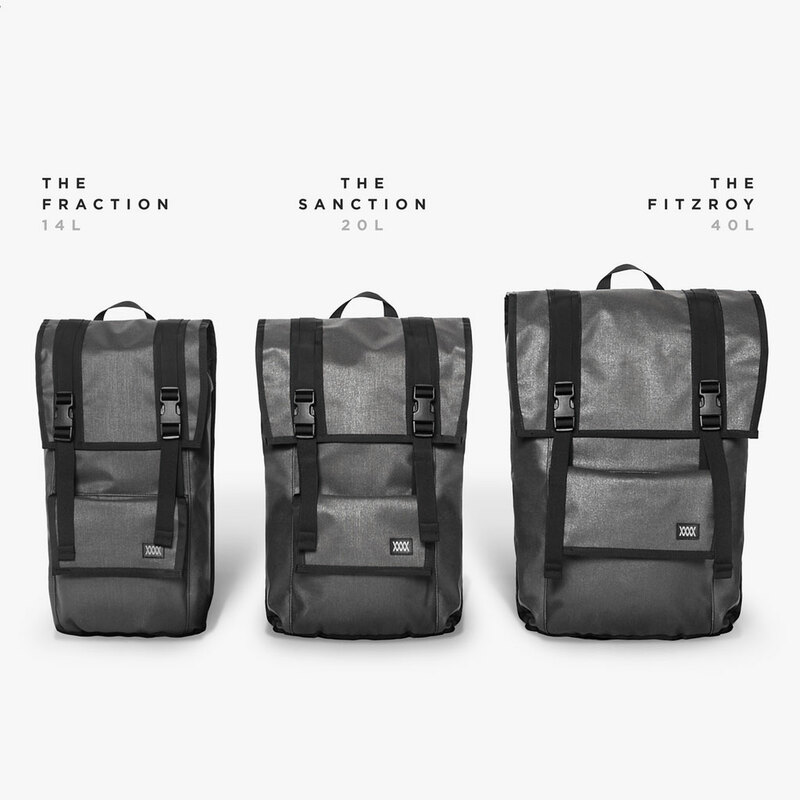 At 20L, the Mission Workshop Sanction (middle) is the perfect size for everyday carry. Ah, Outlier. Maybe I automatically have some bias here, since Outlier is one of my favorite brands. 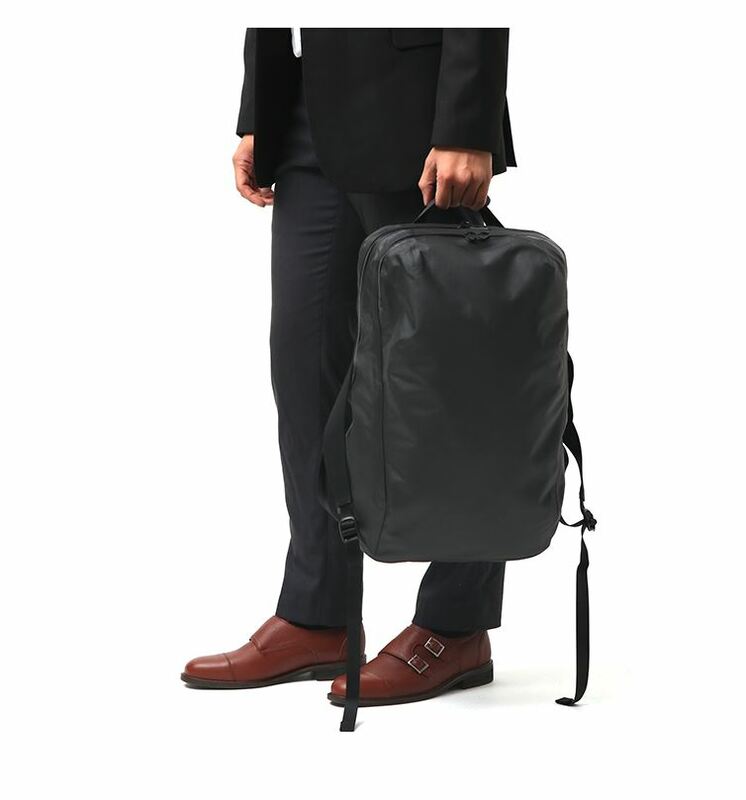 Most of my current wardrobe is from Outlier, and I have used this bag’s sibling – the Ultrahigh Rolltop backpack – as my office backpack for the past few years. 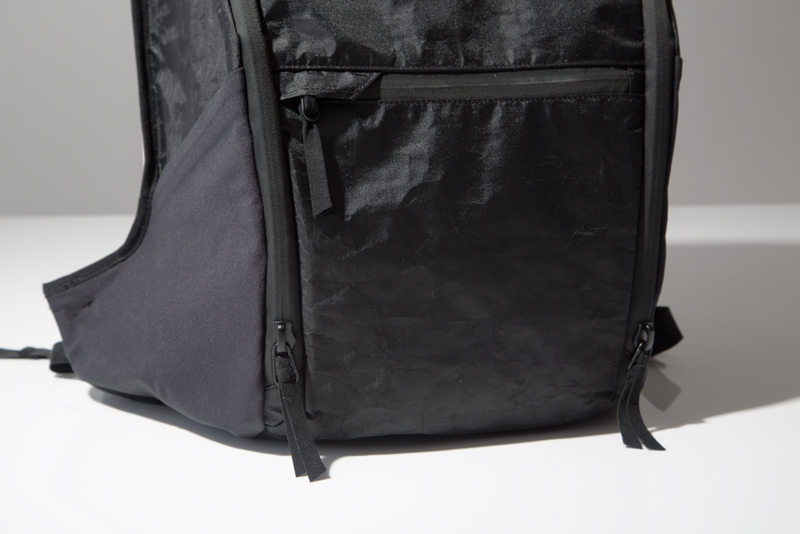 See our review of the Outlier Ultrahigh Rolltop Backpack by clicking here. The Quadzip uses an ultralight material called cuben fiber (same as the rolltop and all their other bags so far). This material isn’t for everybody, but it is a nice departure from all the nylon bags we usually see from most brands. The big story here is the clever use of dual zippers on each side so you can open the bag from the top or from the bottom. This makes for a much more useful bag with access to all corners without needing to put the bag down. 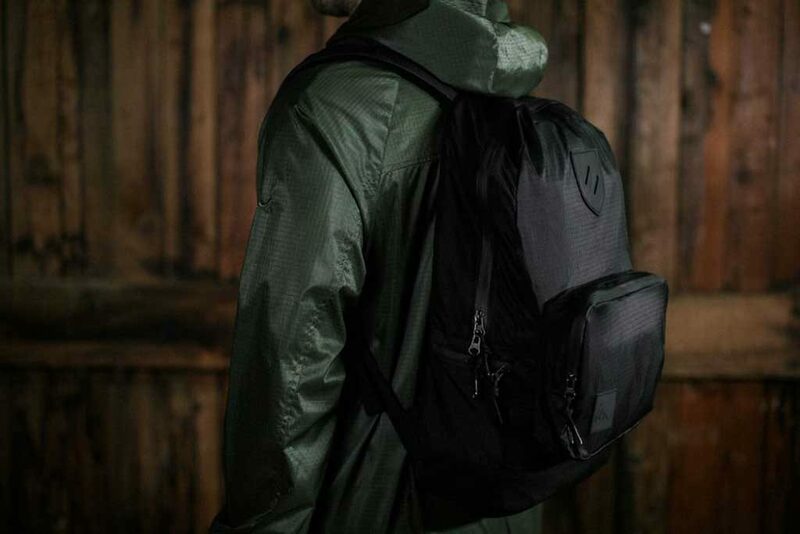 Outlier is relatively new to the carry game, this is only the third backpack they’ve designed, but it is really dialled in with well thought out features like an ultra light framesheet and stretch side pockets for your water bottle. With just a simple slip pocket in the main compartment and no padding anywhere, this may not be the best laptop backpack if you need lots of padding (unless you bring your own sleeve solution), but at a mere 534 grams, this is the lightest bag in this round-up, and despite its lightness the material is one of the toughest in its weight class. And unlike other ultralight, packable bags, the material has very little give, so all the contents of your bag don’t end up bulging in weird places. This is a grail item for most people. The price tag makes sure of that. But what a beauty this bag is. 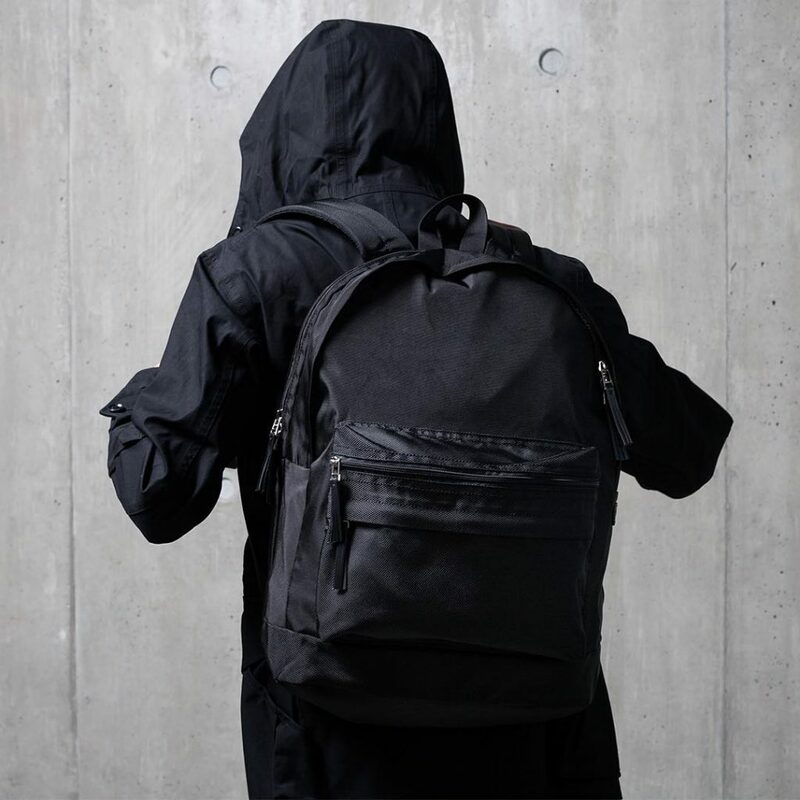 Most people are probably familiar with Arc’Teryx, the outdoor brand, aka “mainline Arc’teryx” with the famous dead bird logo the Veilance line is a special sub-brand specializing in apparel with a more urban aesthetic. 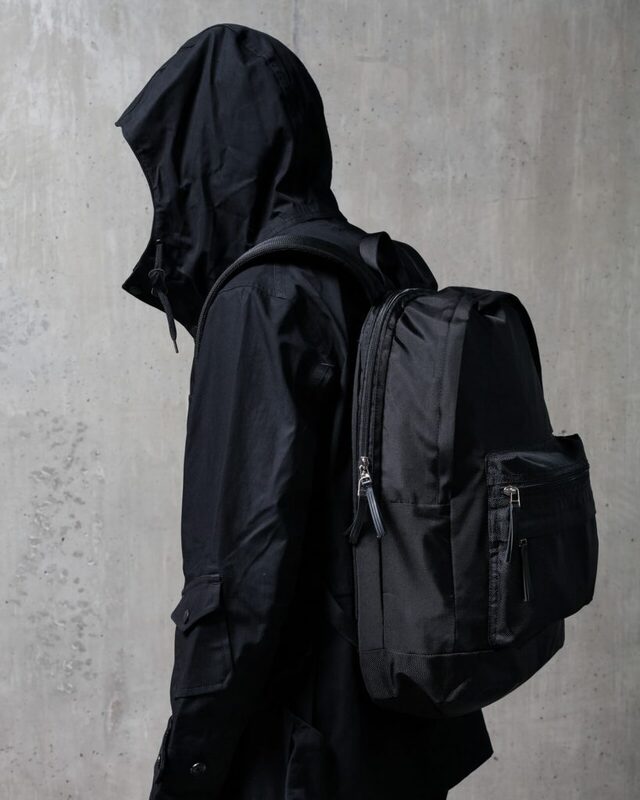 In keeping with this, the Nomin does not feature the famed dead bird logo, and in stark contrast to the mainline’s more outdoorsy aesthetic, this pack is a very stealthy and restrained urban pack. The Nomin is about as suit-worthy as a backpack can get. The clean design and minimal face looks much better than your typical nylon Tumi backpack, with their gold zippers and monogrammed initials. It is made of a water resistant outer fabric, with taped seams, which adds to the weatherproofness yet helps reduce bulk. It’s a two compartment bag, with no external pockets, although there is a “floating pocket” inside the outer compartment. This is a really clever design, allowing you to pull the pocket out when you swing the bag to one side. If you want a utilitarian, minimalist pack, this is probably one of the best urban backpacks out right now. 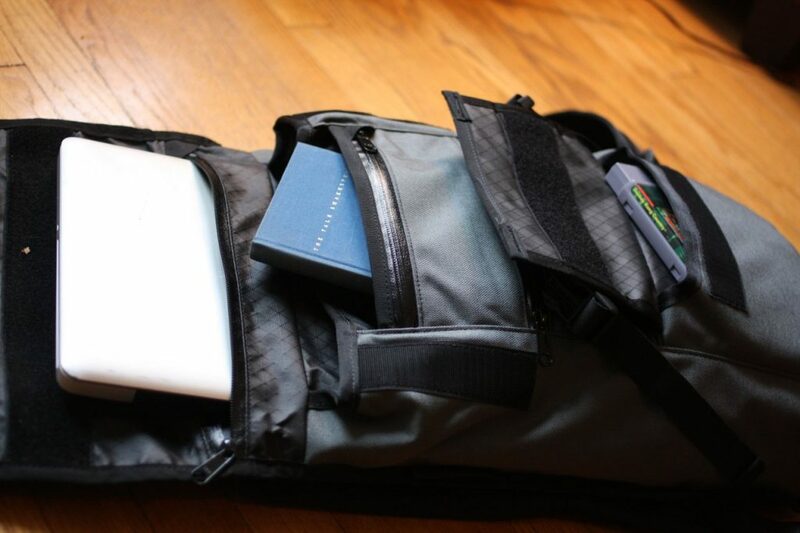 There is a removable laptop/binder folder that attaches inside the main compartment via velcro, although I would hesitate to call it a dedicated laptop pouch. It’s quite a bit large, and seems almost designed for corporate-issued bricks. If you’re carrying a Macbook Pro or a similar thin laptop, you’ll want to bring your own laptop sleeve or throw a jacket in there to make sure your laptop doesn’t fly around. You can see our review of the Nomin pack by clicking here. You can shop the Nomin on Haven. Best travel backpacks for onebag travel.